Karlee Merrick is struggling to recover her husband's death. She needs to be strong, both for herself and for her two children; she wants to stand on her own two feet. But two men are more than willing to help Karlee put her life back together. Although Randy, her highschool sweetheart, can melt her heart with his green eyes, Karlee finds herself drawn to David, the handsome born again Christian so different from any man she's ever known. When a mystery is uncovered in her late husband's papers, Karlee questions the intentions of both men . Does Randy know what's best for her? If David has been living a lie, can she still believe in the God he claims to serve? Becky Melby is a Wisconsin resident. She and her husband Bill have four married sons and eleven grandchildren. Becky has co-authored nine Heartsong Presents titles and written two novellas for Barbour publishing. In her spare time Becky loves riding on the back of her Honda Gold Wing or making trips to see grandkids in the RV. Wisconsin native Cathy Weinke and her husband have two sons, a daughter, and two grandchildren. Her favorite pastimes include reading, painting room murals, and walking her dog. 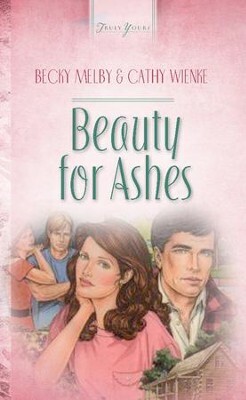 Cathy has co-authored numerous books with her writing partner Becky Melby for Barbour Publishing. I'm the author/artist and I want to review Beauty For Ashes - eBook.